Damien Lewis? Is Playing?? Toronto Mayor Rob Ford??? 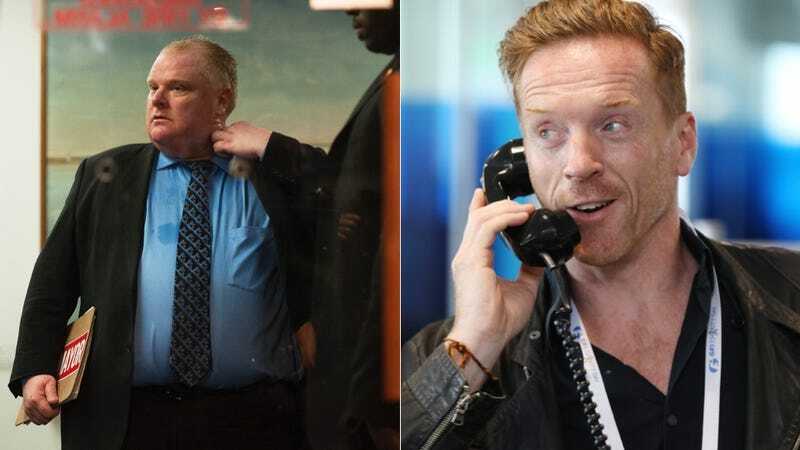 An eon ago, when we were young and the world was new—which is to say, the early 2010s—one of the most shocking political stories going was the sordid tale of Toronto mayor Rob Ford. Obviously it’s being made into a movie and the man cast as the infamous politician is... Damien Lewis. Kit Magazine, which published an interview with Lewis, reported the actor was being fit with a prosthetic to play the former mayor. Many of the details remain under lock and key—IMDb doesn’t even have character names—but the film is understood to follow a reporter (Ben Platt) who attempts to expose a scandal involving a politician who doesn’t play by the rules. The politician’s aides, played by Nina Dobrev and Mena Massoud, try their best to handle him and keep the story suppressed. Additional cast members include Scott Speedman and Jennifer Ehle. This is a good time to ponder the fact that we will be reliving the Trump presidency for the rest of our lives, thanks to all the movies and TV shows that people will be making forever.